Poutine consist of shoestring fries, sprinkled with shredded mozarella cheese(those use for pizza), then pour on gravy(those you get in KFC mash potatoes), and behold, a delicious snack, Poutine, I had it during my study time in Canada whereby i work in the school canteen, and they serve poutine on certain days of the week, and at time i made them, just as described above, And lo and behold, they are snatched up quickly. 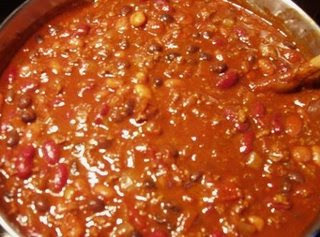 So far, i have not seen any restaurant in Malaysia offering poutine, i think some restaurant do offer chili fries, which is fries top with chili, Wendy’s does served something similar, which is baked potatoes topped with chillis, but chili(pic below) is not my thing. 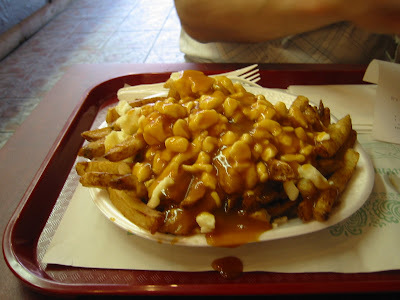 For more info on poutine, you can view this site, perhaps a MIT students, usually poutine recipe will specify cheese curd, don’t think they sell cheese curds in Malaysia, shredded mozarella will do just fine.